If you don’t have a Kindle or don’t like to read books from your computer screen, “The Raven’s Fire: Book Two of the Dukarian Legacy” is ready for purchase in paperback form on Amazon.com. So if you read and liked “The Third Dragon”, you will love “The Raven’s Fire“. I think my writing and story-telling greatly improved by this second book. I bet you will agree. Sometimes I am hesitant to read new authors. But when I saw the popularity and reviews of the Night Angel trilogy by Brent Weeks, I decided to check them out. At once, I was drawn in and intrigued. In no time at all, I had read all three books, “The Way of Shadows”, “Shadow’s Edge”, and “Beyond the Shadows”. I was lost in the world of the Night Angel trilogy. And after reading it, the riveting sensation lingered in my mind as parts of the story played over and over again in my head. Whenever I read something which affects me like this, my imagination opens up and I am inspired to write. In this case, I also wanted to write a review. But there was no way I could write a better review than the review on Dragons, Heroes, and Wizards blog – HERE. These books are some of the darkest I’ve ever read and I would not recommend them to teens or anyone with a weak stomach. But if you enjoy epic fantasy and want a champion to emerge despite all the horrific odds stacked against him, the Night Angel trilogy is for you. Even in darkness there is light. And even a killer can become a hero. 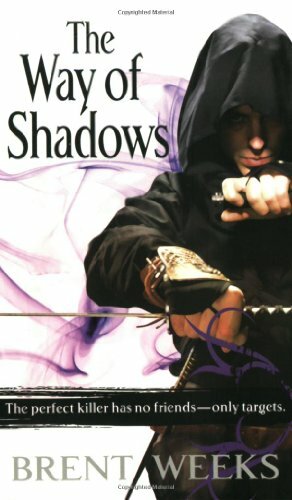 Read a brief overview of book one, “The Way of Shadows“, by Brent Weeks on the Book-a-Holics blog – HERE. Ready to be overwhelmed with mythology? 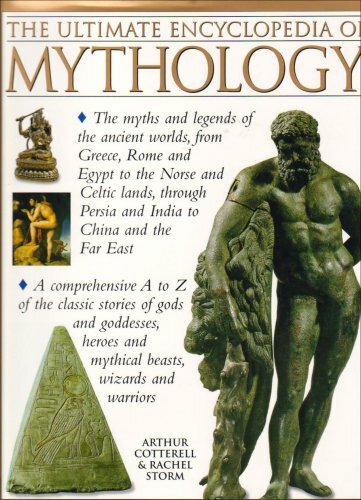 “The Ultimate Encyclopedia of Mythology” seems to cover it all from Norse, Celtic, and Classical Greek to Egypt, India, China and Japan. There must be over a thousand gods, goddesses, creatures, villains, and heroes listed in this book. I don’t know about you but when I watch a movie set in ancient times, I listen for the names of the people and creatures and wonder if they were inspired from mythology. This encyclopedia helps me to see if I am right. It also helps to inspire story ideas for writing a fantasy novel. There are six parts to this book. Part I covers the mostly familiar mythology of Greece and Rome. Surely you’ve heard of Jason and the Argonauts, Hercules, Achilles, and Helen of Troy. Perhaps you’ve also heard of Poseidon, Midas, Gaia, and Medusa too. But have you heard of Electra, Hypnos, or Oceanos? Electra was the daughter of Agamemnon. She is involved in an interesting tangle with her brother Orestes who killed their mother for the murder of their father. Hypnos was asked by Hera to lull Zeus to sleep so that she could attack Hercules. Oceanos was a Titan, the son of Gaia. He protected Hera when the gods fought the Titans. He also married his sister and produced 3,000 rivers. Part II covers the mythology of the Celts. Celtic mythology includes King Arthur and St. Patrick. Other interesting people include Finn MacCool, Thomas the Rhymer, The Fomorii seat gods, and Uath the water giant who had challenged Cuchulainn, Laghaire, and Conall to a beheading contest. Part III is about Nordic mythology. You know a little of Thor and Loki through The Avengers. And you’ve probably heard of the Valkyries and Valhalla. But do you know about the tragic love story between Brynhild the Valkyrie and Sigurd? What about of Ran the story sea goddess who is also called the Flame of the Sea because she loves gold. Next, the encyclopedia gets into the mythology of Egypt and west Asia. You probably already know a little about Osiris and Isis. Maybe you’ve even heard of Gilgamesh. But have you heard of Baal? He was the chief god of the Canaannites who lived in the mountains of the north, defeated a sea god named Yam, died in the underground dwelling of Mot, but came back to life when his wife, Anat killed Mot. Also included in this section of mythology are biblical figures such as Abraham and Moses. Part VI is mythology even more unknown to most in the western world. It is the mythology of east Asia which includes China and Japan. Because I watch a lot of martial arts movies, and because my husband is Chinese, I know a little bit about the Jade Emperor, the Long Wang (or Celestial Dragon), and the Eight Immortals (also called the Eight Drunken Immortals). But other interesting mythological characters I found in “The Ultimate Encyclopedia of Mythology” include Hachiman the Japanese god of war, Fu Xi a creator god, and Izanagi and Izanami who were part of the Shinto beliefs. “The Ultimate Encyclopedia of Mythology” lists hundreds of people and creatures and gives a brief snippet of what they were known for. It does not, however, tell the whole story. Use the encyclopedia as a stepping stone to find interesting characters and get a few basic story ideas. I myself would like to read a bit more about Brynhild, Baal, and Izanagi and Izanami.